The Canon 7 is the last series of interchangeable-lens, Leica-compatible rangefinders made by Canon in the 1960s. 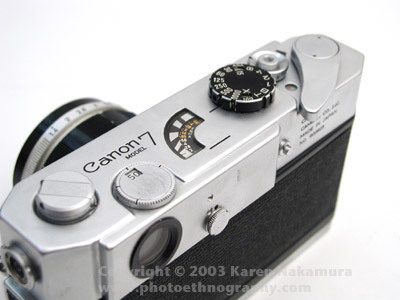 There are three body types in this series, the original Canon 7 with a selenium cell (1961-65); the CdS metering Canon 7s (1965-67); and the very slightly modified Canon 7s Type II (or 7sZ using Peter Dechert's naming style; 1967-68). Using the text or images on this website on an ebay auction or any other site is a violation of federal law. Following on the footsteps of the enormously popular Canon P, the 7 retained the single-magnification viewfinder (reduced to 0.80x magnification) but added coupled metering and switchable framelines. 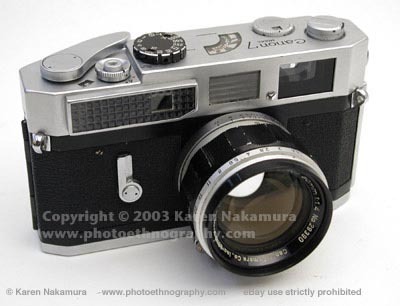 The 7 rangefinder has been said to be one of the most complex ever made, even more complex than Leica M finders. Because it is single-magnification only, it is clear and bright, even after forty years. 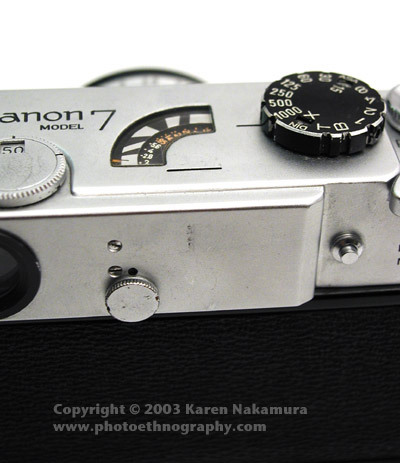 The Canon 7 was designed to be the flagship model of the Canon rangefinder system. Unfortunately, in 1954 Leitz released its Leica M3 rangefinder camera, a model that astonished the camera world with its innovativeness. 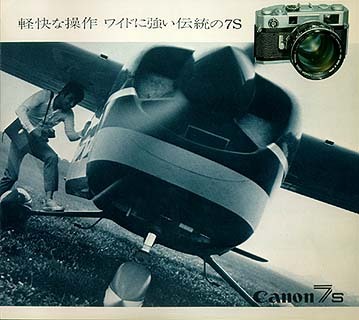 At that point, most camera manufacturers in Japan decided that it would not be possible to beat Leica at its own game. The M-mount was patented and Canon/Nikon were not able to make M-lenses as they had screwmount lenses. The remaining market option was to make SLRs where there was less European competition. Zeiss had the Contaflex system which was hampered by the lens-shutter and the Contarex, which was incredibly heavy and cumbersome. Ihagee and Praktica were making SLRs on a smaller scale but were not serious competition. 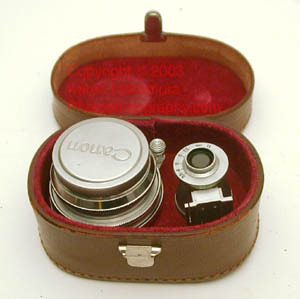 End-users wanted to use longer lenses and filters, or do macrophotography, which made it easy to sell SLRs. 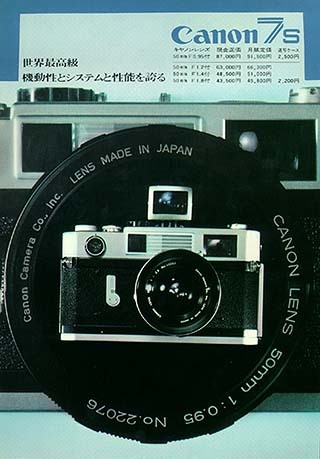 Practically at the same time, Asahi, Canon, Minolta, Nikon, Olympus, and Ricoh all produced SLRs - interestingly all with different and incompatible mount systems. * One could easily argue that we are now in the Second Golden Era of rangefinders. In the past decade, a series of fantastic new cameras have come out: Cosina Voigtlander Bessa R/R2/R2A/R3A/T/L, Konica Hexar RF, Nikon S3-2000, Leica M7/MP and Zeiss Ikon. * I heard that there is a Japanese company that does full overhauls of Canon rangefinders, replacing the steel curtains with titanium curtains that don't crinkle. Unfortunately, the overhaul costs about $500 so it isn't cost effective for the most of us. First curtain of this unit has very slight oil stains which can be removed by alcohol easily. Second curtain are very slightly wrinkled. In either case, performance is not affected. This is merely a cosmetic issue. There's a ring surrounding the shutter button, marked "A", a red unmarked dot, and "R". "A" is for Advance (normal firing mode). The unmarked red dot is the very desirable shutter lock. The "R" for the Rewind release. When turned to rewind, the shutter releases and you can rewind the film. I have it on good authority that the shutter self-caps when in 'Rewind' mode, so there's no need to cover the lens. But I do it anyway out of habit. My one gripe about the 7 is that the its maximum ASA film sensitivity is 400. This is pretty low and by the time the 7 was released (1961), they should have bumped it up to 800 at least. By the 7s, they should have pushed it to 1600. But even the 7sZ is still limited to 400. You can of course manually compensate because the meter is manual, but it's still a pain. OK, gripe over. This unit is very clean with only minor marks on the chrome. I love the little rotating "eyeball" that tells you the camera is winding and rewinding (that the sprockets are engaging). This is handy if you develop your own film as you can tell when the leader releases from the sprokets (the eyeball stops rotating) when rewinding the film. At that point, you can open the back leaving the leader still sticking out of cartridge, which makes it simpler to load into your film reels. There's a double lock on the back release, you have to engage the bottom release and the side release. What a pain! 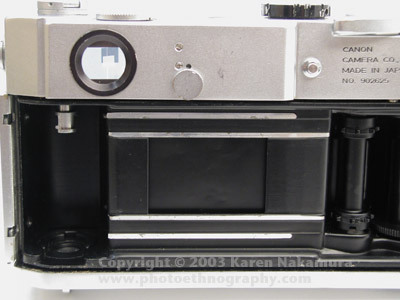 It's designed to use the Canon film cartridges which like their Leica/Contax counterparts, had a film gate that opened and closed keyed to the lock on the bottom. The cartridges don't use a felt light trap which means they are less likely to scratch your film. I picked up one of these cartridges while in Japan and will let you know how it works. 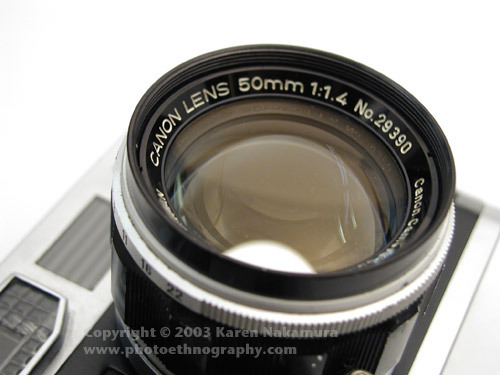 There are some non-Canon wide angle screw mount lenses that you should not use with the Canon 7 because the internal light baffles are in the way. Most of the web sites in the links below will tell you which ones. I general, most collapsible lenses are also bad. The only disappointment is that I can't use the Russian Jupiter 35mm Biogon-clone, which is one of the few Soviet lenses that gets rave reviews (although truth be told, I like my Jupiter-8 52mm lens). It's very easy to knock classic rangefinder cameras like the Canon 7 out of horizontal or vertical RF calibration with knocks or jars. This is fairly common on older (and even newer) rangefinders. Thankfully, Canon provided for a way to adjust horizontal and vertical RF calibration without opening the camera up. Note: This operation while simple, has the possibility of scratching your camera if you have the wrong size pin-wrench and for the 7, fouling the innards of your camera if you muck it up. Please use reasonable and appropriate caution when thinking about doing this. I found that I had to remove the plug using a set of sharp pointed medical tweezers. Turn it counter-clockwise. The tweezers work great. Under the plug there is a screw, which may serve to tighten things down, and it got really scary when it got to loose. I found I had better success prying gently forward or backward until I got the patch right in the vertical. I then had to use the horizontal alignment screw to bring the horizontal back in. This must be done after a vertical adjustment. You are right. It took a very small screw-driver. I had a little set that I bought as Sears for $6.95 (I see them there all the time---the kind with one handle and six or seven bits in the blue and clear domed case). It occurs to me that the plug may have been intended to bear on this whole arrangement and mine does not, though this would surprise me as my camera is pretty much mint, without even a wrinkled curtain. All the Canon III- and IV-series models look and work like an old-style screwmount Leica, except that they have combined range/viewfinders (with switchable magnification.) They're beautifully made and fun to use, but the viewfinders don't have framelines and are very squinty by today's standards. The III and IV models have conventional fabric shutter curtains that are no less durable (but no MORE durable) than the same type of curtain used on Leicas. The V-series (the V is a roman numeral) and L-series (the L is just a letter) are similar to prior models under the skin, but have larger, more modern-styled bodies (with a conventional back door for easier loading) and a viewfinder with a larger eyepiece. This makes viewing more pleasant, but you still don't get framelines or parallax compensation. Late models in these series switched from fabric shutter curtains to ones made of epoxy-coated stainless steel foil. These are the ones you've heard about getting 'damaged' -- the foil can be dented by finger pokes during loading, or if the camera is left to sit for years and years with the shutter cocked. BUT -- minor denting (the most common type) doesn't affect the accuracy of the shutter, and unlike fabric curtains, these won't rot or burn through, meaning they're actually MORE durable than fabric ones. So, as long as the shutter runs smoothly, don't be put off from buying a camera with the steel curtains. 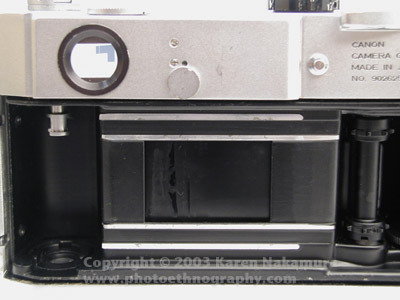 The V came in two flavors: the V-T series, which advances the film via a horizontal trigger on the bottom, and the V-L series, which is identical except for having a conventional advance lever. The L-series was an 'economy' range with equal quality but somewhat simplified features; all these had a lever-type advance lever. (Either flavor rewinds by a knob, which is a bit slow but par for the course in that era.) All the Vs can be good, reliable user cameras if you find an clean example, and are very usable if you don't need framelines and don't mind the slightly antique shutter-speed-dial arrangements. The VI also had a viewfinder with switchable magnifications, but with the added feature of framelines for 50mm and 100mm lenses (there was a separate position for 35mm lenses with no framelines.) 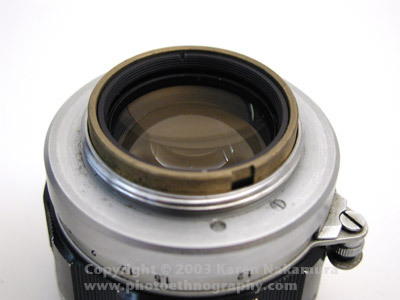 The frames are reflected off a glass inside the eyepiece, rather than being projected through a frosted window as on a Leica M3 or Cosina/Voigtlander. The Canon's reflected system isn't as sharp and clear, but at least the lines do move as you focus to compensate for parallax. The great thing about this viewfinder was that the 50/100 position showed you the finder image at full life-size magnification, so you could keep both eyes open while looking through the camera. The downside was that the complex optics in this finder system haven't aged well, so it's not uncommon to find a VI with a hazy viewfinder and dim framelines. Cleaning may help the haze, but there doesn't seem to be anything that can be done about the framelines -- they're silvered onto a glass plate and the silvering simply deteriorates with age. Also, the finder system has an unusually strong minus diopter built into it, and if you've reached the age where you need reading glasses you may find it difficult to accommodate your eyesight to a VI finder. Aside from those potential drawbacks, if you can find a VI with a finder that's clean and has good framelines, it's very effective and pleasant to use. Like the V, the VI came in -T and -L series flavors with trigger or lever film advance, now with a folding rewind crank for faster rewinding. They were made in about equal numbers, but the -T is more common in the US and the -L is more common in Japan. Either is a bit of a collectible nowadays so may be a bit disproportionately expensive as a 'user' camera, but a good one IS really nice to use. Like the V series, the VI had an economy-model companion, called the P. In this case the strategy may have backfired a bit, because the P was so nice that many people liked it BETTER than the higher-end models; it wound up outselling the VI cameras by a margin of about 5 to 1. Although it was considered the economy camera, it was as well-made as the VI and had the same shutter design and basic features as the VI-L, including thumb lever film advance and folding rewind crank. The only major cost-cutting change was a simpler viewfinder: no switchable magnifications, and with 35mm, 50mm and 100mm framelines all together in the same view. But many people preferred this, because it gave parallax compensation with the 35mm framelines as well as 50 and 100 (although the 35mm lines are 'way out at the edges and hard to see.) The finder was still full life size, so you could view it with both eyes open, and its built-in diopter isn't as strong as the VI, making it an easier adaptation for users' eyesight. The P's framelines can deteriorate the same way as on the VI, but because the finder optics are simpler, P viewfinders seem to have aged better. If you're primarily a 50mm lens user with occasional forays to 35mm or 100mm, the P is maybe your best choice; unfortunately, a lot of other people have figured this out, so you'll pay the price of its popularity! Overall, assuming equal condition (a big 'if' anytime you're buying a 40-to-50-year-old camera!) I'd say the 7 is the best buy for a user who likes to use a range of lenses, while the P is the best buy for someone who's happy with just a couple of lenses and appreciates a smaller, more classically elegant camera body. 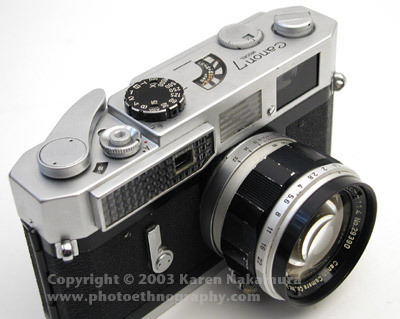 I also agree with the person who said you get more picture-taking bang for your buck by buying a nice, new Cosina/Voigtlander Bessa, with its brighter, sharper viewfinder, built-in TTL meter, and new-camera reliability. But the Canons have a solidity, finish and 'presence' that you just don't get from a Bessa -- so if that sort of thing appeals to you, go for it! Used with kind permission of Jim Williams who wants to add the caveat that he wrote this while waiting for his dinner and this should not be considered to cover every minor variation between the models. 0.8 x RF magnification. 47.2 mm effective baselength. 1.00 x magnification factor. 58mm effective baselength. Framelines for 50/85/105/135mm (manually selectable). Auxiliary viewfinder for 28/35mm. Body+lens: 140 x 81 x 31 mm, 865 g with 50mm f/0.9 5 Body: 138mm x 77mm x 36mm; 595g. 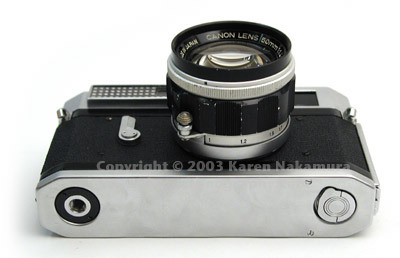 and a Canon 7 body alone in less pristine shape is going for > $400 at CameraWest. Plus I saw some good reactions from Leica users who got the same lens. with comments once I have it. Yes, I think you got a great deal. I'm jealous! I wouldn't CLA it until you get it and you know what's wrong with it (slow shutters, etc.). I'm in the school of don't fix it unless it's broke. The seller already indicates that shutter is inaccurate on the "slowest speeds", which I don't worry about as I don't want to use a tripod. I will see how the camera performs. Only thing that bothers me is the probable lack of light meter, although I guess I can work around that. I will check on the RangeFinderForum for a list of Canon RF repair people, will pass along anything useful I find. Karen, my Canon 7 + 50mm /1.4 arrived - looks great! To my eyes the lens looks flawless. The shutter curtain is really flat, not crinkled at all. The focus patch is pretty clear, and seems to be working correctly. Even the light meter seems to work, although I need to test it. I am looking forward to getting some film in it! Which brings me to a question - when I open the door, the slot on the take-up spool is not immediately visible. I discovered that by putting the camera in rewind mode and moving the advance lever, I can rotate the spool so that the slot is visible. But is this the "right" way to do it? Another question - this is the first time I have used a screwmount lens. To take it off, I locked the focus at infinity, and it unscrewed pretty easily. I had a little more trouble screwing it back on. Is there a correct orientation with which to seat the lens when you first put it on? What does the red dot on the body mean? Sorry for all the questions, would appreciate you sage advice. That's great! I knew it'd be in better condition than you expected. Japanese sellers tend be extremely critical when selling (and when buying). So you got a great deal! There's really no easy way to prevent crossthreading on screw mounts. That's one of the problems and the reason why folks went to bayonet mounts. Karen, thanks for the pointer to the manual. I read it over. As it suggests, I had actually turned the spool by hand, but felt some resistance (really just a little tension) and thought I might be doing something wrong. I am out of film, will get some tomorrow and try loading and shooting. As nice as the camera seems, I would like to see some pix and be convinced that it is really working. On another front, my M3 should be on its was way back this week, with full assurance from KEH that it has been fully tested. 1) The Japanese sellar provided a very nice deal - I shot one test roll with the camera + lens, and was more than satisfied - I can't attach photos here, but I was able to take indoor shots with slow film that look great. Outdoor shots look fabulous, sharp with high contrast. Maybe not as nice as my Leica lens, but interesting in their own way. 2) The internal light meter is probably not working - it was all over the place, and I would not rely on it. (I used my Leica MR as a handheld.) That's OK, I can use an external meter - or better yet, use this as the excuse to better develop my own judgement. Unfortunately, my Leica M3 continues to languish at KEH - they are really trying to "do right" by me. I will not go into the bloody details - at least I have a working camera for the moment.